※ If the measurement by the questionnaire is not yet finished, the display will remain the default (initial value). The Let’s try it with (→) here! 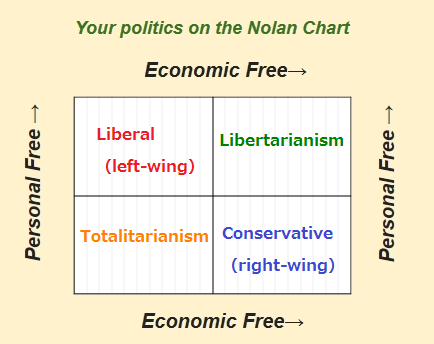 Position to respect the “personal freedom”, disregard the “freedom of the economy”. Position that “freedom of the economy” and “individual freedom” also respect. Position to respect the “freedom of the economy”, disregard the “personal freedom”. Position that “freedom of the economy” and “individual freedom” also neglected.